Pumpkin Bread is one of my favorite quick breads to make in the Fall. 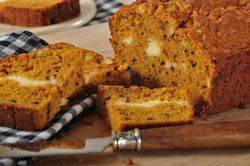 This moist honey-colored quick bread is full of pumpkin flavor and its complementary spices. But what really sets it apart, is the vein of cream cheese filling running through it's center. I love how the tanginess of the cream cheese pairs with the sweetness of the pumpkin bread. This recipe makes two loaves, so you can eat one straight away and freeze the other. A few notes on making the cream cheese filling. You want to mix the ingredients just until creamy and smooth. This can be done in a food processor or with a hand mixer. I prefer to use a hand mixer for this, but if you are using a food processor, do not over process the ingredients. Over processing will result in the filling being too thin which may cause it to simply "melt" into the pumpkin bread as it bakes. But do not worry if this happens as the pumpkin bread will still taste delicious. Second, once the cream cheese filling is placed in the pans, I find it best to use two spoons and place small dollops of the pumpkin batter on top of the filling, and then smooth the top. This Pumpkin Bread recipe calls for canned pure pumpkin (do not buy the canned pumpkin that has the spices already added) but you can also make your own pumpkin puree. Just use the smaller pumpkin varieties like Sugar Pie, Baby Bear or Cheese Pumpkin (approximately 5-7 lbs., 2 1/2 - 3 1/2 kg.). Cut the pumpkin in half lengthwise, remove all the seeds and stringy fibers, and place cut-side down on a greased baking sheet. Bake at 350 degrees F (177 degrees C) for approximately 45 minutes to 1 1/4 hours (depending on size) or until easily pierced with a knife. Scoop out the pulp and puree in a food processor until smooth. Then strain the puree through a piece of cheesecloth suspended over a strainer to extract all the liquid. Cool before using. Pumpkin Bread: Preheat the oven to 350 degrees F (177 degrees C) and place rack in the center of the oven. Butter and lightly flour two - 9 x 5 x 3 inch (23 x 13 x 8 cm) loaf pans.